After more than 2,000 auditions and months of rumors and hearsay, Disney and Lucasfilm have finally found their brand new scruffy looking nerf herder in Alden Ehrenreich. Yes, the Hail Caesar! actor will be playing a young version of Han Solo in the Phil Lord and Chris Miller directed Star Wars spinoff tentatively titled Han Solo: A Star Wars Story. And it's hard to agrue that this casting isn't nearly perfect. Especially considering some of the other choices that have been teased over the earlier part of this year. Though Disney has yet to release an official statement on the casting, Deadline has reported that Ehrenreich is in final negotiations to pilot the Millennium Falcon. The studio brought in seemingly every actor in Hollywood who maybe would fit the role and Ehrenreich beat out the likes of Kingsman star Taron Egerton, Transformers: Age of Extinction star Jack Reynor and even Dave Franco, who discussed the pressures of the audition process to take on the role of the iconic character who was of course first brought to the big screen by Harrison Ford in Star Wars: A New Hope in 1977. Many fans have been skeptical of having someone else take on the role of Han Solo, especially after Ford's return to the character in Star Wars: The Force Awakens being so fresh in everyone's mind. That being said, Ehrenreich is actually in a lot of ways the perfect casting choice and if fans are going to have to get used to the idea of someone else roaming the galaxy with Chewie, this is probably the best case scenario. 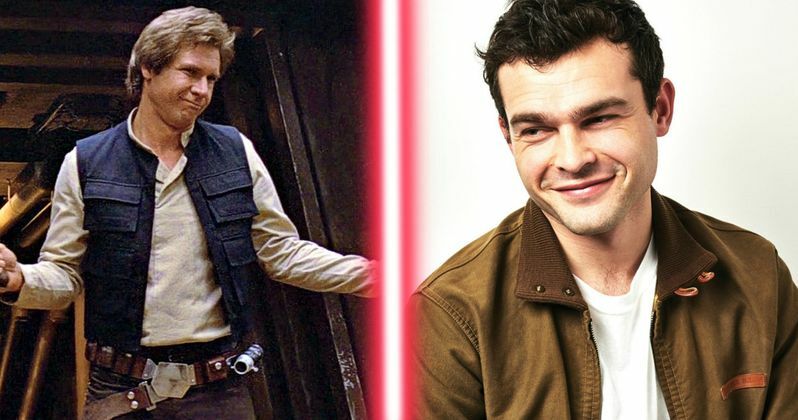 For one, Ehrenreich is currently 11 years younger than Ford was when he first portrayed Han Solo in A New Hope, so we are not being forced to accept somebody taking over the role of Han Solo in the timeline established by the original trilogy. Instead, it can be more like when River Phoenix portrayed a young Indiana Jones in The Last Crusade, but over the length of several full films as opposed to just having a small part in one film. Ehrenreich is old enough for it to not be silly but young enough to make sense. When many people read this casting news, there is a good chance that they hadn't even heard of Alden Ehrenreich and even if they had, they have probably only seen him in a film or two that flew somewhat under the radar. This is a good thing because much like Daisy Ridley as Rey in The Force Awakens, we won't be looking at Ehrenreich as anything but Han Solo for the most part. On the flip side, if Taron Egerton had been cast, it would have been hard not to see him as Eggsy from Kingsman, at least to some degree. Ehrenreich will be able to inhabit that role and fans will get to know him as Solo, which is what makes the most sense and gives it a much better chance to work. Speaking of Rey, in recent years Disney has had a pretty great track record in terms of casting, be it for Star Wars, the Marvel Studios films or even their recent live action adaptations like The Jungle Book. Disney and Lucasfilm took this casting process very seriously and reportedly tested over 2,500 actors for the role. Ehrenreich was not picked because he was a hot name or on a whim out of a pool of several actors who seemed to make sense. This process was brutally meticulous and that should lend some credibility to the decision. Also, Lord and Miller as directors have yet to make a bad film and they appear to be taking this with every bit of gravitas the fans could hope for. Nobody can be Harrison Ford except for Harrison Ford, we know that much. However, Ehrenreich when compared to Ford on a side by side does look more than similar. He definitely has a close enough look that with the right hair and makeup could be an uncanny resemblance. If Rian Johnson was able to make Joseph Gordon-Levitt look like a young Bruce Willis in Looper, surely Ehrenreich can look enough like Ford for people to be able to suspend their disbelief and association for it to work. With that said, there are few in any characters as iconic as Han Solo and it may simply be impossible for the masses to accept anyone but Ford in the role. The Force Awakens was a great return to a galaxy far far away and Rogue One looks great from what we've seen so far, but as of right now we still don't know how these spin off, anthology films are really going to play out. And on the flip side of the coin, Ehrenreich is somewhat untested and it is easy to understand how people could see that as a negative with the casting choice. Like it or not, the Han Solo movie is happening and is set for release on May 25, 2018. It is being directed by the team behind The LEGO Movie and 21 Jump Street, Phil Lord and Christopher Miller and will reportedly focus on Han Solo and Chewbacca's early days as smugglers prior to the events of A New Hope.